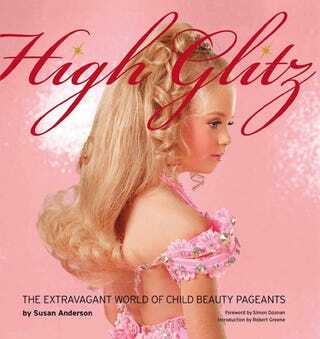 Susan Anderson's photography book High Glitz —which includes thought-provoking essays by Simon Doonan and Robert Greene, as well as a guide to everything glitz—presents a portrait of the bizarre American pastime that is the world of child beauty pageants. In his essay, "Artifice and Transformation: The Imaginary Lives of Little Girls," author Robert Greene presents a feminist analysis in defending the pageant industry, proposing that when we "respond in one of two ways" to young girls in pageants—moralizing or laughing—we might just be "imposing ourselves on them [and] responding out of certain preconceptions." Greene argues that by doing this, we are assuming that these young girls are merely the instruments of their mothers' desires, and have no desires or instrumentality of their own, because we're "not used to treating the inner lives of young girls with the proper seriousness—as a subject worthy of study and analysis." Underneath it all is the unstated assumption that [girls] are essentially passive and weak…Boys can create their own worlds; their fantasies can be dark and violent, but we can accept the fact they correspond to some desire or need inside of them. Girls are empty vessels, screens of projection; they are not the agents or producers of their world, or so we think. We do not recognize that they could produce something strong, strange, and even freakish all on their own. [H]e discovered two timeless elements in [little girls'] fantasy lives—artifice and transformation. In the tight world of Victorian England, he found them masters at reversing conventions and creating nonsense—a literary genre Carroll would later explore, inspired by his encounters with these girls. Greene believes that everything in our world is "fake," as our own conventions are merely creations. Our "relaxed looks in clothing are as artificial as the world of Marie Antoinette, only less spectacular and creative." He sees the portraits in High Glitz as a kind of "reverse commentary" on our "drabness and inauthentic relationship to the artificial." While Greene's argument is compelling, the fact remains that many of these girls are entered into pageants by their mothers when they're only a few months old, and thus, personal agency is not even up for debate. However, having been a little girl who was drawn to make-up and make-believe at a very young age—and knowing, even then, that it had nothing to do with appealing to male fantasies, but rather, indulging in my own—I can say, personally, that much of what Greene says here rings true. Perhaps gender is a construct, and liking the color pink, being partial to dresses, and having a predilection for mermaids and unicorns are learned behaviors. But then how does that explain say, transgender children, or little boys who—at ages as young as 18 months—have those same interests, despite the fact that they've been taught not to? It doesn't. But what does seem clear is that both girlie girls and trans kids alike are often told by society as a whole that their common attraction to frilly femininity is frivolous, and thus, invalid. And maybe that's a bigger problem for feminism than pageantry. However, the fact that this little girl is only 9-years-old and looks like a Hooters calendar girl is still unsettling. Call me narcissistic, but I cannot help contrasting the show-bizzy lives of these tarted-up tots with my own bleak, post-war, scabby-kneed British childhood…and then I become horribly jealous. If only somebody in our house were to have figured out that all I ever wanted was to parade about—like a Madame Alexander doll come to life—in front of a cheering crowd, bathed in adoration and soft pink light. Doonan realizes that his views aren't popular, but he doesn't care. The knee-jerk antipathy towards this all-American ritual is starting to bore me. The predictable tongue-lashing meted out to child beauty pageants is clearly coming from dreary, over-educated, middle-class people who have never been intoxicated by the spotlight. Will these girls end up huffing glue on the street corner? Will they become the Amy Winehouses of the 2020s? I seriously doubt it. As with teen beauty queens, the most likely scenario for a former pageant babe entails, at the very least, marrying a local business man, and/or reading the weather on the local news channel, and/or slinging peanuts on a domestic airline. Nothing less, and possibly more: Always remember that Shirley Temple, the primordial glitter from which all child pageant contestants subsequently emerged, lived to become—drum roll—a U.S. Ambassador. Much of the pageant world is confusing to outsiders. For example, why does a 2-year-old need acrylic nails? In the "High Glitz Style Guide," Anderson breaks down the elements of the pageant categories, explains the specifics and purpose of each part of the presentation and costumes, and describes the required model stances like "Pretty Feet." This getup would be filed under Pro-Am (aka Sportswear or Western Wear). The "liquid beading" and fringe of these Bob Mackie-esque outfits are strategically placed, and a proper Pro-Am costume includes a "Rip Off" (the part of the garment that is removed during a routine and used as a prop for twirling), and "Oohs and Aahs" (facial expressions). Still, the Style Guide doesn't explain the purpose of a fabric Frisbee with a hole. All images courtesy of High Glitz, by Susan Anderson, published by powerHouse Books.